A polygraph test is administered to determine whether or not statements made by the subject taking the test are deceptive. During the test, the subject is monitored by a polygraph machine and interrogated by an administrator trained in forensic psychophysiology. The machine measures changes in the subject's blood pressure, heart rate, respiration rate and sweat production. The theory underlying the polygraph test is that a person who is lying exhibits involuntary physiological responses that can be detected by the polygraph instrument. These changes include rapid breathing and heartbeat and increased blood pressure and perspiration. The polygraph instrument usually measures four to six physiological reactions recorded by three different medical instruments that are combined in one machine. Older polygraph machines were equipped with long strips of paper that moved slowly beneath pens that recorded the various physiological responses. Newer equipment uses transducers to convert the information to digital signals that can be stored on computers and analyzed using sophisticated mathematical algorithms. The three components of the polygraph instrument include the cardio-sphygmograph, the pneumograph, and the galvanograph. Blood pressure and heart rate are measured by the cardio-sphygmograph component of the polygraph, which consists of a blood pressure cuff that is wrapped around the subject's arm. During the questioning the cuff remains inflated. The movement of blood through the subject's veins generates a sound that is transmitted through the air in the cuff to a bellows that amplifies the sound. The magnitude of the sound relates to the blood pressure and the frequency of the changes in the sound relates to the heart rate. The pneumograph component of the polygraph records the subject's respiratory rate. One tube is placed around the subject's chest and a second is placed around his or her abdomen. These tubes are filled with air. When the subject breaths, changes in the air pressure in the tubes are recorded on the polygraph. The galvanograph section records the amount of perspiration produced. It consists of electrical sensors called galvanometers that are attached to the subject's fingertips. The skin of the fingertips contains a high density of sweat glands, making them a good location to measure perspiration. As the amount of sweat touching the galvanometers increases, the resistance of the electrical current measured decreases and these changes are recorded by the polygraph. Most forensic psychophysiologists (FPs) consider the cardiosphygomgraph and the pneumograph components more informative than the galvanograph. During the polygraph test, the examiner and the subject are alone in the questioning room. Before the test begins, the examiner spends about an hour talking with the subject. Most forensic psychophisiologists consider this pretest phase an extremely important part of the polygraph. The examiner obtains a baseline read on his or her emotional state and develops the questions that are asked during the actual test. Before the test begins, the examiner goes over each question with the subject so that he or she knows exactly what to expect. When they are ready start, the person administering the polygraph attaches the various components of the polygraph instrument to the examinee. directly to the focus of the polygraph test. Examples of relevant questions are "Did you commit crime X?" or "Did you ever use drug Y?" Control questions vary depending on the type of test administered. The most common type of polygraph test is the Control Question Test (CQT), in which control questions are composed so that the subject can answer them honestly, however, the examiner may make them slightly provocative to evoke an emotional response. Examples of control questions are "Did you ever think of doing crime Y?" or "Were you ever drunk in the last year?" This allows the examiner to understand the subject's physiological responses to challenging questions. In the CQT, greater physiological responses to the relevant questions than to the control questions indicate deceptive behavior. There are variations to the CQT. In Directed Lie Tests (DLT), the examiner substitutes very broad questions for the control questions and the subject is directed to answer them with lies. An example is "Have you ever told a lie?" to which the subject is directed to respond "No." This response gives an examiner an understanding of the subject's physiological response associated with lying. In Positive Control Tests (PCT), a relevant question itself is used as a control. The subject is instructed to answer truthfully the first time the question is asked and falsely the second time it is asked. The only factor that influences the response is whether or not the subject is lying. In the Truth Control Test (TCT), the control questions are composed to make the subject think that he or she is being accused of a fictitious crime. This gives the examiner information on how the subject responds to a truthful denial. During the post-test, the forensic pschophysiologist analyzes the subject's responses to the questions and scores them. Each channel of the polygraph is scored individually. For any channel, if the control response is larger than the relevant response, the score is from +1 to +3, depending on the magnitude of the difference. If the relevant response is larger the score is from −1 to −3. The scores are summed over all channels and all repetitions of the questions to get to the total score. If the final score is sufficiently large and positive, then the subject is considered to have made truthful statements. If the final score is sufficiently large and negative, then the statements are considered deceptive. If the result is close to zero, then the test is inconclusive. There is much debate as to the accuracy of polygraph tests. Most forensic psychophysiologists agree that the rate of detecting deceptive behavior is greater than the rate of detecting truthful behavior. The American Polygraph Association claims that the accuracy rate for polygraph tests is between 85 and 95 percent. However, reports of false positives have reached as high as 75 percent in research done by the Congressional Office of Technology Assessment. Methods for determining whether or not a person is lying have been part of civilization since ancient times. Ancient Hindus required an accused person to chew a mouthful of rice and then spit it out on a leaf from a sacred tree. If the person could spit the rice he or she was declared honest and if the rice stuck in the mouth, dishonest. This test presumptively relies on the physiological response, which makes a person's mouth dry when being deceptive. In the nineteenth century, Italian criminologist Cesare Lombroso developed an early device for measuring and determining the pulse and blood pressure of a person undergoing interrogation, similar to the cardio-sphymograph component of the polygraph. In the early 1900s, Russian psychologist A. R. Luria measured the reaction time and tremors in the fingers of suspected criminals. A student in experimental psychology at Harvard University, William M. Marston invented the modern polygraph prior to 1921. His treatise The Lie Detector Test on understanding physiological responses related to deception was published in 1938. John A. Larson, a police officer in Berkeley, California, modified Marston's polygraph, developing a technique for continuous recording of physiological responses. One of Larson's colleagues, Leonarde Keeler, added the gavanograph component to the polygraph. He joined the faculty of Northwestern University School of Law in Chicago in 1930 and established the Keeler Polygraph Institute of Chicago. Lawyer, John E. Reid played an important role in the development of questioning techniques used during a polygraph test. In a 1947 paper, he described the use of control questions to evoke emotional responses. In collaboration with Cleve Backster's work, this idea eventually became the Control Question Test (CQT), which is used by the majority of forensic psychophysiologists today. During the 1960s and 1970s, the polygraph business grew rapidly. Employee screening became a multi-million dollar industry. Polygraph testing began to be used routinely in police work and polygraphers were used as expert witnesses in criminal court trials. 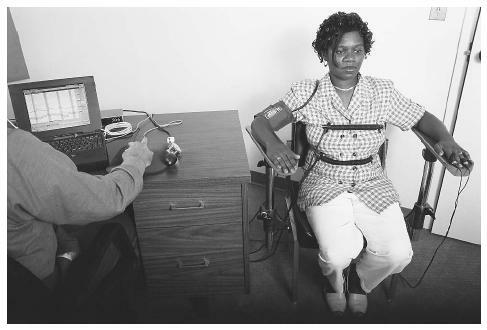 During the late 1970s and early 1980s, the use of the polygraph by the military and security agencies expanded drastically. Between 1973 and 1983, polygraph tests by the federal government tripled. By 1985, the Department of Defense was administering 25,000 tests a year. They used polygraphs to screen employees for classified status, for counterintelligence and for criminal investigations. The FBI, CIA, and National Security Agency used the polygraph to screen job candidates. In 1979, two-thirds of the people rejected for employment from CIA jobs were rejected on the basis of failed polygraph tests. In the 1980s the scientific validity of polygraphs was brought into question by psychologists. In 1988, the federal Polygraph Protection Act was passed, prohibiting employers from using polygraphs for employment screening. As a result of this legislation, businesses can ask an employee to take a polygraph, but the employee's refusal will not result in any disciplinary treatment. This law does not protect government employees, including people who work in schools, prisons, public agencies, and businesses under contract with the federal government. The use of polygraphs in court was brought to trial in 1989. In the case of United States v. Piccinonna, a polygraph was deemed admissible as evidence, only if both sides agree to its use or the judge allows it based on criteria set forth in the case. A Supreme Court ruling in 1998 expanded the judge's authority in the use of polygraphs in federal cases. Some states accept this ruling, but not all. On the state level, polygraph use is dependent upon the judge and the case. And, in U.S. v. Schellee (1998), the Supreme Court upheld a personal evidentiary rule against the admissibility of polygraph evidence at military trials. Harrelson, Leonard. Lietest: Deception, Truth and the Polygraph. Ft. Wayne, IN: Jonas Publishing, 1998. Lykken, David T. A Tremor in the Blood: Uses and Abuses of the Lie Detector. Reading, MA: Perseus Books, 1998. Jussim, Daniel. Drug Tests and Polygraphs. New York: Julian Messner, 1987. How Stuff Works. "How Lie Detectors Work." < http://science.howstuffworks.com/lie-detector.htm/printable > (April 15, 2003). American Polygraph Association. < http://www.polygraph.org/ > (April 15, 2003). could you post a picture of a polygraph machine with parts labeled on it? thank you.